The most powerful sentence you can speak starts with "Imagine"
How do you finish that sentence? What’s on your mind? What’s in your heart? More important, what’s holding you back as you think about finishing that sentence? Can you finish it? Can you dare to dream and give voice to something greater than you are experiencing now? How we finish the sentence that starts, “Imagine I am” says everything about our dreams, our hopes, our station in life, our ambition, our failures, our present, our past, our perceived future. Try it. Say those words “Imagine I am” and finish that sentence. Give voice to your hopes and dreams. These three words are huge for any employee in a company, or organization who wants to not only bring value to the company, but advance their career. I was talking to a young colleague at my consulting firm recently and telling him to `make himself valuable’ by finding something he can uniquely do that brings value to the company and our clients. In some cases it’s simply showing initiative. It’s being smart and insightful and acting on it. As I was thinking about this I reached out to a few of my very successful friends. I wanted to get their thoughts on what `make yourself valuable’ means. I’ve been friends with all three of these people for … well, decades. And that’s a good thing! I was lucky enough to grow up in Bend, Ore. This is well before it got “discovered” and was still a middling old mill town with just one little brewpub in central Oregon. I went to school with both Sharelle Klaus — starting way back at Bear Creek Elementary — and Bart Ricketts (my dad and Bart’s dad were both teachers in Bend). All three of us graduated from Bend High School. Sharelle and Bart have had remarkable professional careers and remain in the Pacific Northwest. Josh Rowe and I attended the University of Portland together on athletic scholarships, running cross country, track and indoor track. We logged probably thousands of miles together across north Portland and in our beloved Forest Park in northwest Portland. Josh has had an amazing marketing career at Nike, New Balance, with some startups in Boston, and now at Harvard Innovation Labs in Boston. “I think that making yourself `valuable’ to the organization is probably a case-by-case scenario. For example: as a mid-market General Contractor, we need people that understand construction, but can adapt technology to our pre-construction and building practices. So what does this look like? The person that knows how a building goes together technically, but can manage Building Information Modeling / Virtual Design & Construction (Revit computer modeling, etc.) is the current `invaluable' position for us. This might be different for each company, market sector, industry. “I not only tell young people in our organization this, I tell people trying to get a job at a certain place. What do you uniquely bring to an organization, or what have you done that demonstrates your unique value to an organization? I was talking to a marketing friend yesterday. He mentioned when he was hired for his first marketing job he had no marketing background, but he’d started a podcast and grew it to 15,000 or so followers in a matter of months. The company hired him based on his clearly demonstrated passion for the space—not for his background or what was on his resume. Be unorthodox. The conventional world needs you. We all should be more unorthodox. Be inventive. Take risks. Love, nay embrace, a good chance. Have flair. Be zesty. Do spicy. Grow rainbow corn instead of plain ol’ yellow corn. Be willing to do unorthodox when you aren’t sure how it’ll turn out. I’ve been unorthodox in writing and failed miserably. I tried a new writing style for one of my stories I had published in a newspaper and an editor told me to never do that again. I learned from it. But I didn’t quit taking risks as a writer. We are what we make. So what are you making in 2018? At work, at home, in life, we’re making and producing. It’s written in our DNA to make. We make food, goods, and products in our jobs and at home. We also make reports, presentations, efficiencies, or any number of things. We make DIY stuff we find on Pinterest or from YouTube videos. We also make the big things. We make our lives and we make businesses, ideas, cultures, and legacies. We’re largely defined by what we’re making. It’s who we are and how we’re known. In large part it’s our identity. This hit home for me recently as I was finishing a final paper on one of my Master’s degree classes on communications research methods. I am back in college after a long hiatus with an emphasis on acquiring new knowledge and skills in strategic and crisis communications. My thought process is with 20 years left in my career — give or take — I want to make them count and do meaningful work for great organizations. I want to challenge myself, be stretched, and broaden my professional network. But my overarching goal remains to do great work and elevate the organization I’m partnering with. This particular class had been a struggle for me until one of my older sons, a 2016 college graduate who is working in the management trainee program for a global company, asked me if I needed help. What a gift. I immediately said yes. So he sat with me and together we pored over my textbook. We talked through the areas where I was struggling. We worked through the concepts I wasn’t grasping. He helped me walk through a software program to analyze a survey that was part of the class curriculum. He was my sounding board on my ideas for my paper. It was illuminating. It was fun. It’s something I’ll remember. His help was a little thing, but it changed everything for me in that class. And as I worked alongside my son, I saw with clarity what 20-plus years of “making” can look like. It was a reminder in that moment, at the confluence of my past, present, and future as a father, professional, and student, how essential my values are in what I make. It’s easy to get blurred vision and lose sight of the big picture in the daily grind of life and work. We can make decisions and move in directions that seem inconsequential at the time. But they can have big implications down the road. — Don’t cheat just a little. — Don’t just get by. — Never let failure define you. Let resilience and grit define you. — Character, compassion, honesty, caring, commitment, optimism, passion … they all still matter. — Be dependable and reliable in an unstable world. — Have faith among faithless. — Always have hope amidst despair. — Be kind. And respectful. — No one is beneath you. — Ambition is good. Just take others with you in that drive upward. — Lead well, with conviction and humility. — Truth and authenticity are in demand. — Find answers instead of excuses. — Be careful what you wish for. — Being “real” and honest never belittles or maligns. — Stretch yourself and get out of your comfort zone. I’m sure there’s plenty of other things to add to this list. You know what they are. And as I compiled this list, I realized how many of these things I aspire to. I’m still in “making” mold. Now the questions are for you. I originally put up this blog post on my Medium account. For my first go round in college, I ventured off with an electronic typewriter. No laptop. No internet (Al Gore hadn't invented it yet*). No cell phone (I had a AT&T calling card). I walked across campus to all my classes, often through the relentless Portland, Oregon, drizzle. It could be quite depressing for a kid raised in the dry, sunny High Desert of Bend. At least college was affordable back then. An athletic scholarship I earned for cross country and track paid my tuition and my folks, God bless 'em, picked up my room and board. I left college debt-free. Things are different for me this time around. I take all my classes online at Purdue University, a school that's 756 miles away. Most of my professors teach remotely far from Purdue and my fellow students are scattered across the country. I don't expect to ever set foot on campus for this go round. I work full-time and do freelance copywriting for a side hustle. This past summer I drove across the country from Virginia to Oregon and back while still working and taking several vacation days, all while taking a class and completing coursework online. As "vacations" go, it was different. I'm accumulating debt in my pursuit of a master's degree. No scholarship was available because I've burned up my eligibility (and possibly because my competitive days are long past, as anyone who's seen my trying to hoof it around my neighborhood can attest). I launched this 20-month, 10-class journey because I love to learn. I want to expand my professional skills and increase my knowledge. I don't want to be afraid to try new things. I'm so impressed by the caliber of my fellow students. I'm grateful to be along for this ride with them and appreciate gleaning from their insights and experiences. I'm looking forward to "meeting" many more students this year in my future classes. I'm almost halfway to earning my degree and earlier today I got a letter from Purdue. 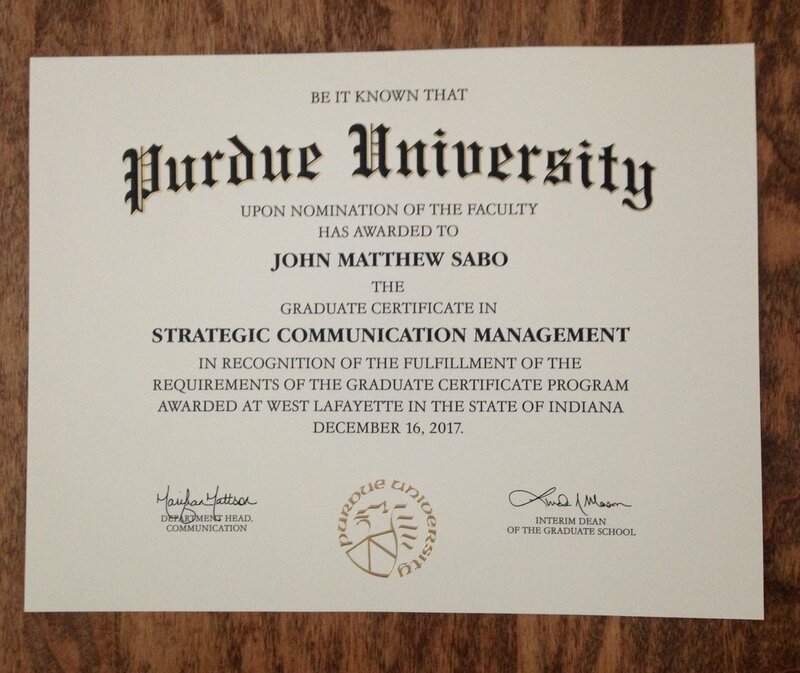 It was a Graduate Certificate in Strategic Communication Management that I earned after completing my first few classes. When I showed it around the house, my wife gave me a smooch and my kids clapped. I'm so thankful for their encouragement and support. Sometime in December, I'll graduate with a Master of Science in Communication with an emphasis on Strategic Communication. I imagine there will be more smooching and clapping in the Sabo house. Maybe we'll have a little ceremony. I could walk across my living room to get my Purdue diploma. Maybe we'll gather all 14 kids, two daughters-in-law, and one grandson for my graduation. At least this time when I graduate, I already have a job and won't have to move back in with my folks until I find work. And I'll be able to write a blog post on my computer and post it on this thing called the internet and people will read it on their smart phones. A Chesapeake Bay deadrise workboat. The iconic boat of Chesapeake Bay. A glance out my window this morning and I knew what I had to do. Fog had rolled in, casting an eery glow and shrouding the neighbor's pine trees in a misty cloud. Everything looked still, which means one thing: The water will be like glass. I have a "go to" spot in these situations. It's a small public landing with a rickety pier of twisted boards and precarious steps next to a decrepit marina a mile or so from my house on Sarah's Creek. This morning the water was indeed like glass, as I predicted. The oaks and poplars along the shoreline are shorn of their leaves in the winter chill. Looking at the reflection of their bony branches and limbs in the creek is like looking in a mirror on days like these. I started shooting photos with my iPhone. I gingerly walked along the pier, a firm grip on my phone, steadying my feet as I went. Tethered to the pier as it slinks along the shoreline of the Northwest Branch of the creek rests an aged Chesapeake Bay deadrise boat. The white paint is peeling. Some of the deck boards are rotting. Her best days are well past. It's a sad sight. I'm not a boater. I've never been crabbing or oystering out on the bay, but I'm enthralled by deadrise boats. They're eye-catching, a combination of muscular, but lithe and sleek. Distinctive with their low profiles -- often they have V-shaped bows -- and flat bottoms, they're called the workhorses of the bay. They're built so watermen can ply the choppy waters of the bay when the winds and storms quickly flare up and also to maneuver in the shallow waters. Every deadrise workboat has a story, as you'll see. As I was shooting photos an older gentleman in jeans, a hoodie and black ball cap walked up. We started chatting and he told me the "Donna Jo" was his boat. It was built in 1988, the same year that Virginia declared the Chesapeake Bay deadrise workboat as the official state boat. He gave me the dimensions and told me he was going to repair it. But the weather abruptly turned cold, as it typically does in Virginia. "You can't work in the cold," he said. Instead of repairing his beloved deadrise, his wife dispatched him take care of a "honey-do" list that included replacing the bathroom floors and commodes -- his use of "commodes" instead of "toilets" kind of cracked me up -- in their house. But it would only take him about two weeks to repair his boat, he said. He has all the lumber. He'll just have to be careful tearing off the old wood. The hull is in good shape, he said. She'll back on the water when it warms up, he said. He said he would spend summers on his deadrise workboat out on the bay catching blue crabs. He'd make $75,000 to $100,000 crabbing. "Some people don't think that's much money," he said. At some point our conversation about his deadrise got derailed. Politics came up. He cussed the government -- especially Democrats -- for a good while. Every time he mentioned Democrats he included an `F'-bomb. Every single time. He loves Trump. Really, really loves Trump. He fears for our country. He wonders what's happened to our country. But later this spring, when the weather warms back up, he'll be giving Donna Jo a face lift. Look for her out on Chesapeake Bay. She'll be gleaming white beneath the broiling Virginia sun with bushels of blue crabs on her deck. I was asked recently how I have handled working for difficult managers or in difficult situations. I thought about it briefly, remembering one manager in particular I worked for who thrived on chaos. He continually manufactured crisis after crisis, presumably to solve problems of his own creation. It was a brutal form of management that exacted a terrible toll, leading to a revolving door of employees. I never understood how his superiors stood for it and it was an epic fail on their part that they were so uninvolved and uncaring of the business they were supposed to be leading. As I thought about this manager, I immediately thought of living here on the mid-Atlantic coast along the western shores of Chesapeake Bay. It's a place where hurricanes occasionally barrel through, prompting residents to hunker down in the driving winds and rain. A respite occurs when the eye of the storm passes through. I thought about what it's like in the eye of the hurricane, this strange sensation of calmness and tranquility and a brief respite from what's come and what's to arrive. I answered the question posed to me by saying that in a time of chaos I find the eye of the storm and operate in that. Essentially I shut out what's going on around me and focus on what I can control in the moment. For me, as a writer, that entails zooming in on descriptive elements of the story I'm writing. What I hear is my storytelling voice, that inner voice that dictates elements like structure and pacing. What I see are the details that make the story, the descriptive words and phrases and word pictures that breathe life into the copy. What I don't see and hear is the noise and drama around me. That's what finding the eye of the storm and operating in it looks and feels like to me. For at least 20 years, I have been a volunteer youth coach. Primarily it’s the result of being the father of 14 kids born in four different decades. Yes, 14 kids over the course of four decades: The ’80s, the ’90s, the ’00s and the ’10s. My wife is amazing, eh? When it comes to youth sports, coaches are always in short supply. At each stop along my coaching journey, Prineville, Ore., Corvallis, Ore., and Gloucester, Va., there’s been a desperate need for youth coaches. So with a sports background and inevitably with my own kids in the Parks and Rec system, I have volunteered to coach. One thing that has really surprised me along the way happens routinely years after I coach a kid who generally falls into the age range of 6 to 11. The kid I coached, the one who couldn’t hit a baseball, or make a bucket, or dribble a soccer ball with his feet, makes it. By “make it” I mean ends up playing varsity sports. There are some kids who I can easily predict will go on to bigger and better things. A classic example of this is a lad named Jeffrey Hendrix. I coached him in coach-pitch baseball in Corvallis Little League around 2000 or so when he was about 7 or 8. Even at that age he had a sweet left-handed swing and it was no problem for him to hit my pitches. I soon learned where Jeffrey’s wheelhouse was and would throw to that spot and inevitably he would rip the ball to center or right field for a big hit. One day his father came to me and inquired about my pitching strategy. I told him where Jeffrey liked the location of the pitch and where I threw it. He smiled and asked me to mix up the location of the pitches so Jeffrey could learn to hit other pitches. Let’s just say he learned to hit other pitches because in 2015, Jeffrey Hendrix, after a great career as an outfielder at Oregon State University, was drafted in the 4th round by the New York Yankees. I’d like to think that my mixing up pitch locations in coach-pitch baseball had something to do with it … keep dreaming, eh? But there’s been plenty of other times where some of the kids I’ve coached surprised me. These are kids who I was pretty sure wouldn’t play another season because they didn’t appear to have much interest, talent, skills, or even coordination for that matter. But then I would see them in the newspaper or hear about them playing varsity in high school. My shock would often be palpable: How did that happen? So what happened? They stuck with it. They worked at it. For hours. They matured physically and coordination happened. They had a passion and drive to practice something they loved for hours on end and it paid off. It’s what noted psychology professor Anders Ericsson describes when he talks about “Expert Performance.” Many years ago he discussed this with Freakonomics authors Steven Levitt and Stephen Dubner in an article that appeared in the New York Times that outlined his ideas. One of Ericsson’s ideas is “deliberate practice.” This entails setting a specific goal, obtaining immediate feedback and concentrating on technique as much as outcome. That old cliche that practice makes perfect is true. One of the big takeaways of Ericsson’s work is that many of us believe we have inherent limits. It’s just not true. Now certainly we’re not all born with equal potential — my Samoan buddy Jake Moevao is built like a defensive lineman in football, which is what he played in college, and no matter how hard he trained, he very likely would not make a fast marathoner. Yet what if there’s something we truly love? But we’re just not good at it. I’ve come late to life to woodworking. There’s something about it that feeds my creativity. I’ve made a couple of coffee tables and some picture frames. I’ve gotten some compliments on one of my coffee tables in particular and it’s been pinned on Pinterest several times. That’s something, eh? But the quality is somewhat suspect and there’s things I would do differently. That’s precisely the point though. I’m learning what to do better. It’s just practice. My second table was much sturdier than the first. The quality was better, the craftmanship a little more refined. My third effort should be even better. So what is it that you love? But you think you’re not all that good at. Why not give it a shot? And keep at it. My dad, John Sabo, is in his 70s. He was a schoolteacher who taught primarily English and Social Studies in the same city, Bend, Ore., for 30 years. He graduated from UCLA with a film degree — some guy named Francis Ford Coppola was hanging around the school with him — and decided several years ago he would repurpose ratty old cedar fencing into birdhouses and garden and yard accoutrements such as planters and little rustic containers. He’s pretty good at it, as things turned out. Word got out about his little hobby and now he’s got back orders for his creations and can’t build his repurposed cedar fencing projects fast enough. Who knew Mr. Sabo had such skills? The lesson here is obvious: Chase your passion. Keep at it. Set goals. Get feedback. Too often our limits may be imposed by our own false perceptions of skills or abilities we think we may not possess. It turns out passion and hard work can trump all.